If the Eden Valley existed, it had to be in Meteora: this is what we though while visiting this supernatural mix of natural landscape and human-made constructions. Meteora is not only a unique witness of monastic life and art in Greece, but also an incredible place to mesmerize at amazing views, green valleys and steep rock formations that will leave you breathless. Inscribed in the World Heritage list of UNESCO, it is a not to be missed place while visiting Greece. Holy Trynity monastery on top of a pinnacle in MeteoraThe area of Meteora is located in the center-north of Greece in proximity of the villages of Kalambaka and Kastraki. It is famous for being home to a complex of monasteries on top of steep pinnacles, some still in use other abandoned, and surrounded by an amazing natural landscape. It's not a coincidence that the word Meteora means "suspended in the air". While originally there were over 20 monasteries, nowadays only six are still in use and open to visitors, two of which are nunnery and the other four are inhabited by monks. An entrance fee of 3€ is required to visit each monastery; flash tourists, might visit all of them in one single day with a motor vehicle, but missing in this way all of the magic of the area. Orthodox Monks started to populate the area of Meteora over 1200 years ago, initially searching for quietness, peace and the perfect environment Lifting system with ropes in Meteorato pray and meditate. They were living in caves like hermits, with little human relations. Probably at the beginning of the 12th century they started to congregate and create the first monasteries. To make things more difficult, they decided to build their communities on top of rocky peaks, apparently inhospitable places to live in, but with more protection from the outside world, and amazing views to enjoy daily. While visiting Meteora we were continuously wondering how could they manage at that time to climb these steep peaks with very little equipment and later to carry even materials to build the monasteries. The cliffs are as high as 550m (1800 feet) from the plain level, and hardly accessible even today to equipped rock climbers. Originally entrance to the monasteries was possible only with ladders, or ropes connected to nets, used to lift goods and people. Not only it was adventurous, but also really dangerous, since the legend say that the ropes were changed only "when the Lord let them break". The advantage of such an access system was that the ropes could easily be lifted to protect the monks from external threats. The biggest expansion of the monasteries had place at the end of the 14th century, when Greece was threatened by Turkish invaders, and monks from other areas of Greece took refugee in Meteora, building a total of 24 monasteries, progressively abandoned in the last two centuries. All of the Monasteries required an entrance fee of 3€ at the time we visited, and there was no combined ticket. While 3€ is an affordable price, it starts to become a consistent sum if you are planning to visit the six of them. Our suggestion is to visit them all if you can afford it: my experience as a long term traveller taught me that it's better to spend a few coins more when you are hesitant, than regretting not having visited a place and wanting to go back there on purpose. For budget travellers instead it's definitely possible to visit only some of them, and our suggestion is to read our article about the six monasteries in Meteora (forthcoming), to understand which one might be more interesting for you. As a reference we ended up visiting four of them. The monasteries could be visited all in one day with a private mean of transportation and really in a hurry, so we would suggest to devote at least two days for the visit. All of the monastery have different opening time and some of them have a very limited schedule, so it might turn out to be not only inconvenient but also impracticable to visit them all in just one day. Opening time is quite eclectic and it is changing with seasons and years, so don't trust any schedule you might find in internet if not updated in the last week. While there are some elements that are peculiar to each monastery, (different views towards the valleys and pinnacles, layout of the buildings, exhibitions, etc.) many characters remain the same, so some might feel like visiting a few of them might be enough to get the feeling. During high season there is a bus connecting them, but in low season you have to rely either on a private mean of transportation or on your feet. Nowadays all the monasteries are well connected by road through bridges or stairs, so that even the laziest of the tourist can easily access them. Some of the monasteries have also small cable-cars that can be used only by monks to easily access the communities. Even if it's not possible to use them it's really interesting to have the chance to see one operating. We obviously decided to explore them by feet using as much as possible the (little) hiking paths available, but sometimes we were forced to use the main road: it wasn't still too bad since the cars were very few, and many viewpoints, that otherwise we would have missed, were along this route. While walking in Meteora we were impressed seeing many buses packed with tourists going from one monastery to the other without even stopping on the way to enjoy the amazing views. This means to miss all of the magic of this place, the fusion of the human-made monasteries perfectly integrated on top of incredible rock formations, reminding somewhat Cappadocia in Turkey: so please don't do the same mistake and enjoy the route in between the monasteries! Hiking the area is definitely the best way to enjoy nature in Meteora and finding unusual viewpoints. Unfortunately the region is more oriented to package tourists than hikers, so our backpackers life was a little bit complicated. We tried to ask for hiking paths and a map of the trails at the tourist information point in Kalambaka, but the woman that answered us unfortunately was quite rude and of no help. It was much more helpful asking to locals, even if the answer was dependent on the level of "comfort" that each one felt. In fact most of the hiking paths are not maintained, some are totally forgotten, and some ended up being more of climbing routes than hiking paths. So if you don't have some experience with rock climbing, you might want to stick to the official trails, mostly what you can see in this map. They are few but very large and paved, and passing through forests and luxurious vegetation. If you feel more comfortable with climbing instead, you might check also this map with more routes. If you are wondering how the pinnacles were formed, the geological origin of the area is still unclear. We were told by a local artist in Kastraki about an interesting legend involving a couple, a princess and a magic dragon, now resting in a cave; the several scientific hypothesis instead involve earthquakes, fluvial erosion, wind and temperature fluctuation: it's up to you which one you want to believe. Having a look at the hiking map, can help to better understand the structure of the rocks: surprisingly the formations to the South-East side, are aligned to a different direction that the one to the North-West. While hiking in Meteora it's possible also to reach some secondaries attractions like the dragon cave or the monk's prison that we will cover in another article (forthcoming). If you are interested in not missing the best viewpoint to enjoy the panorama and take some unforgettable photos, then you should have a look at our article with a suggestion for a route to make your own independent photo tour with the best viewpoints located on a map. 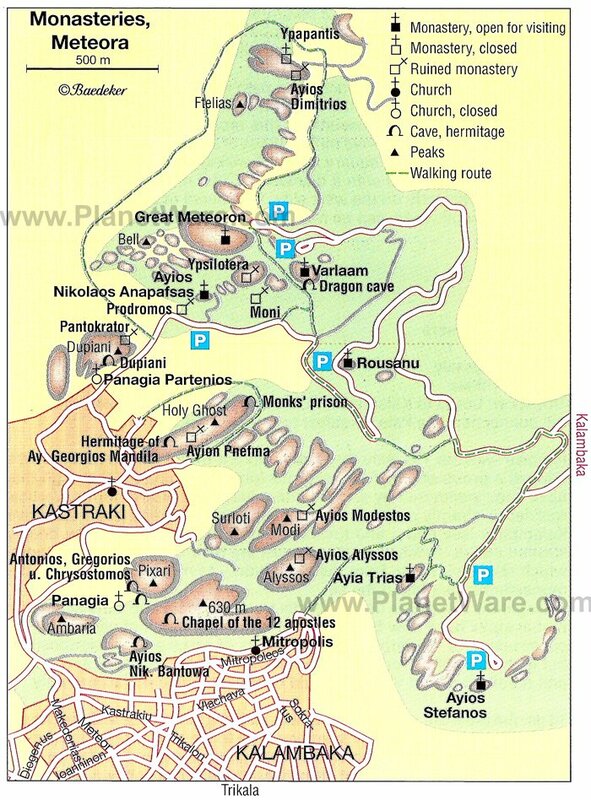 The two villages of Kalambaka and Kastraki are conveniently located at the feet of Meteora. We were actually surprised to find these two big villages there, when we were expecting the location to be in the middle of nowhere. But they weren't invasive and actually adding interest to some of the views from the top. If you are waiting for a clear answer to understand where to look for your accommodation, then you should know that there is no best location between Kalambaka and Kastraki: some monasteries are closer to the former, other to the latter; Kastraki is smaller and more quiet, while Kalambaka is bigger and (relatively) busier, but with much more options for food and entertainment. But we probably got the best location of them all since we stayed in Kalambaka, but at the very end of it, just below the rocks. We were invited and offered accommodation by the manager of Alsos house and it turned out to be a great choice, since the location was really quiet, and it looked like being in an ancient village below the rocks, despite still inside the bigger town of Kalambaka with all of its services. Alsos house has a shared kitchen for guests to cook, that turned out to be extremely helpful to keep our food cost low (there is a Carrefour market and a couple of groceries stores in Kalambaka to buy food to cook, with prices generally more expensive than the main cities in Greece), and for the price of a backpacker hostel it's possible to have the comfort of a private room with a light breakfast included. And just a few meters away from this family run hotel, it's starting an easy hike leading to the Monastery of the Holy Trinity, reachable in about 30 minutes. For people on a very low budget, wild camping in Greece is illegal and we don't encourage it, but there were many places where we would have liked to pitch our tent, let alone passing a night in an abandoned cave. Getting to Meteora is quite easy, since there is a train station in Kalambaka, and with a little bit of planning in advance, it is possible to catch some very good offer on the website of the Greek Railways: we took a train ticket from Kalambaka to Athens, almost 4 hours of travel, for 9€. Also hitchhiking is not a problem in the area: we arrived from Thessaloniki catching four different rides, and despite the infamous stories we heard about hitchhiking in Greece, we never had to wait too long even if we were there in low season with not too many people driving to Meteora. Even if our travel in Greece is still not finished, we are sure that our visit to Meteora will be a long lasting memory and one of the highlights of a new amazing trip!